The sidelined leader said his victory "is the best gift for the 1.5 crore party supporters" on the 30th death anniversary of party founder, the late Chief Minister MG Ramachandran, fondly addressed as MGR. 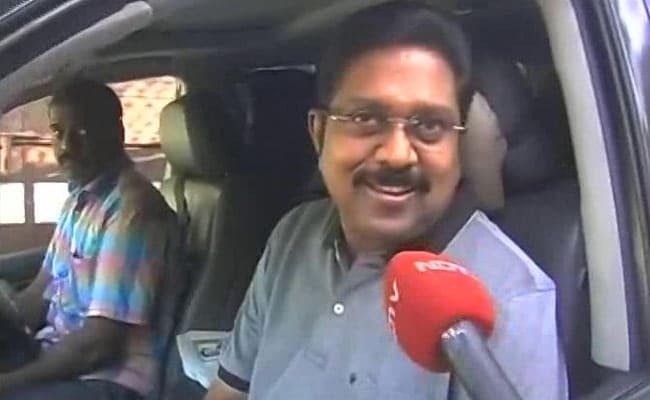 RK Nagar By-Election: TTV Dhinakaran is contesting as an Independent. Madurai: With early trends indicating a huge lead for TTV Dhinakaran in the RK Nagar by-election, the sidelined AIADMK leader today said it showed that people want a change of regime. "We are the true AIADMK... people of RK Nagar have elected Amma's successor." 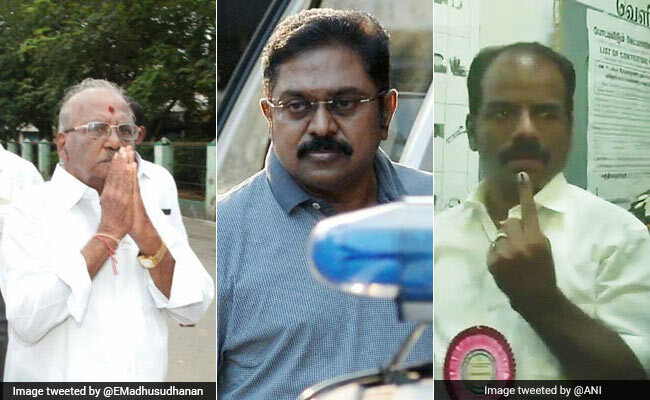 Mr Dhinakaran, who is contesting as an Independent, is leading with 20,298 votes while AIADMK rival E Madhusudhanan is trailing with 9,652 votes. DMK's N Maruthu Ganesh is a distant third with 5,032 votes. "During my recent visits to various parts of Tamil Nadu such as Avinashi (Tirupur) and Arumanai (Kanyakumari), people said the pressure cooker (his poll symbol at RK Nagar) will win. They want a change of this regime," he said. TTV Dhinakaran is ahead of AIADMK's Madhusudhanan and DMK's Marudhu Ganesh. "We are the true AIADMK. A candidate determines the symbol. I have already said the 'Two Leaves' will be a success symbol only if it was with Puratchi Thalaivar (MGR) and Amma (Jayalalithaa). Will the people vote if it is handed over to MN Nambiar and PS Veerappa," he asked, amidst chuckles from his supporters. Nambiar and Veerappa are famous yesteryear villains, with the former being cast against MGR in many of the matinee idol's films. Mr Dhinakaran said the Palaniswami government will "end in three months." The by-election is crucial for AIADMK. The party had split over the issue and the two factions merged in August only after E Palaniswami, who was leading one faction, agreed to O Panneerselvam's demand and evicted Ms Sasikala and Mr Dhinakaran. The two challenged the decision and claim to lead the real AIADMK, though their support in the party is dwindling. Earlier this month, Mr Dhinakaran had lost his claim the AIADMK's two-leaves election symbol after the Election Commission recognised the merged AIADMK as the "real" party. The sidelined AIADMK leader contested with a pressure cooker as his election symbol. TTV Dhinakaran's Outfit Gets New Common Symbol For Polls - "A Gift Pack"